The loss of a single Guillemot on Saturday was saddening but it in no way prepared us for events on Cefn Sidan beach yesterday afternoon. 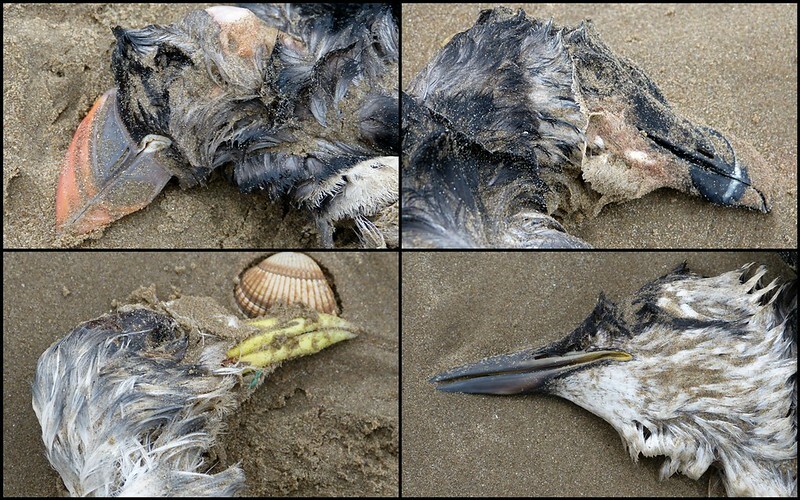 What had started out as an isolated walk to enjoy the crashing waves turned into a research and rescue mission as we discovered hundreds of dead auks spread out over two miles of beach. Every ten to twenty meters seemed to uncover a new body, many of them clearly recent and with no visible signs of oiling or other injuries. The cause of this tragedy is once again the fierce winter storms that have been at the centre of our regions life for the past couple of months. Out at sea rough conditions have made feeding nigh on impossible for these birds leaving them exhausted to the point where even if it was to calm down, the energy to hunt is simply not there. Sadly reports have been coming in from far and wide but it seems that this weekend has seen a peak in casualties being washed ashore locally. Though morbid there is research value in recording these events and with that in mind we diligently counted everything along a two mile stretch. The numbers were simply shocking. Trying to escape back to some normality it was pleasing to see that life was still continuing to hang on with flocks of Kittiwakes at the waters edge accompanied by several hundred Sanderling. As birds go it's hard to find another species that can bring a smile to the face quite as readily as these little bundles of energy rushing back and forth in the surf. Unfortunately it wasn't long however before my eyes alighted on a Guillemot still alive but clearly in trouble. As we approached there was a feeble attempt to stand before the bird sat down and looked at us pitifully. Mindful of our failed efforts yesterday we put in a call to the RSPCA who promised to pass on our concerns to the local inspector. In truth I didn't expect anyone to come and we had to walk on feeling completely helpless, but a couple of hours later we received a call. The inspector had arrived and was asking for directions. Now those of you familiar with Cefn Sidan will know that it is a vast, flat expanse of sand but we did our best and left them to search. Another call shortly after wasn't the update we'd been hoping for however. It turned out that although they'd found the exhausted Guillemot it was too emaciated to save and had to be put down. Hearing that news felt, as silly as this may sound, very much like a personal bereavement as all afternoon we'd been thinking about the bird and hoping for its survival. All we have now is the slightly hollow consolation that we at least were able to end its suffering in as comfortable a manner as possible. As I touched on above this wreck is turning into a much larger event and is certainly the worst I've ever seen in the last decade or so of birding. It's got so bad the local sightings pages are starting to resemble more of an obituaries column than the usual stories of success and discovery. Collating these reports is the job of the Beached Bird Survey which runs every year coincidentally during the last weekend of February. Full details can be found here on the RSPB website and I strongly encourage you to to report your own findings to them. In the meantime all we can do is hope that the populations of these birds can recover and that conditions improve in time for the coming breeding season.